Potomac Pediatrics encourages all school age children to participate in 60 minutes per day of moderate to vigorous physical activity. 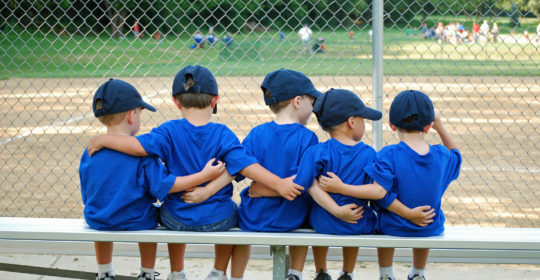 A great way to achieve this goal is to have your child participate in organized sports. Whether it be soccer, field or ice hockey, lacrosse, swimming, basketball, baseball or cross country or running teams, the benefits of participating in sports are multifold. Regular organized physical activity helps achieve healthier weights in children, decreases blood pressure and cholesterol, improves bone health and increases muscular strength and endurance, builds friendships, and is shown to improve self-esteem and confidence. Wear appropriate protective equipment– Ensure that your child is wearing appropriate protective equipment and that it is well fitted: this includes padding, shin guards, helmets, mouth guards, face guards, protective cups or eyewear/goggles. Get enough sleep- Adolescents who sleep 8 or more hours each night are 65 % less likely to be injured. Schedule time off-Plan to have a day off each week and at least one day off a month to allow your body to rest and recuperate. Take breaks- Allow and encourage rest periods during practices and games. Strengthen muscles- Ensure that your child is enrolled with a team or in sport that allows appropriate time for conditioning and strength building which helps to increase the strength of muscles tendons and improve stability of joints. Warm up and cool down- All exercise should begin with a 5-10 minute active warm up to increase body temperature and blood flow to active muscles. Follow each exercise by a 10-15 minute active cool down, which helps to maintain blood flow to active muscles in order to enhance the quality and effectiveness of the recovery period. Use proper technique as reinforced by coaches. Avoid heat exhaustion and heat related injuries- Drink plenty of water PRIOR to your activity, DURING your activity, and AFTER your activity. Do not work out at the hottest time of the day or during high heat/humidity periods. Wear appropriate clothing based on the weather. Play it safe- The rules of your sport are in place for a reason and should be reinforced by parents, coaches, referees, and umpires. Stop whatever activity you are doing if there is pain– Pain is your body’s way of telling you something is wrong, listen to it!